Mantis shrimp like to keep their conversations private, which is why they communicate using the polarization of light. These animals have evolved bright reflectors that control the polarization of their visual signals, a property of light not commonly used for animal communication. Most eavesdroppers can't see this type of light information and so animals that use it are less likely to attract the attention of predators or unwelcomed competition. In a quest to understand how these uncommon light signals are produced in mantis shrimp, researchers from the Ecology of Vision Group based in the University of Bristol's School of Biological Sciences discovered that they use a polarizing structure unlike anything ever seen or developed by humans. The research is published today in the journal Scientific Reports. Using a combination of careful anatomy, light measurements, and theoretical modelling, it was found that the mantis shrimp polarizers work by manipulating light across the structure rather than through its depth, which is how typical polarizers work. Such a photonic mechanism affords the animal with small, microscopically thin and dynamic optical structures that still produce big, bright and colourful polarized signals. Dr Nicholas Roberts in the School of Biological Sciences said: "When it comes to developing a new way to make polarizers, nature has come up with optical solutions we haven't yet thought of. "Industries working on optical technologies will be interested in this new solution mantis shrimp have found to create a polarizer as new ways for humans to use and control light are developed." More information: 'A shape-anisotropic reflective polarizer in a stomatopod crustacean' by Thomas M. Jordan, David Wilby, Tsyr-Huei Chiou, Kathryn D. Feller, Roy L. Caldwell, Thomas W. Cronin and Nicholas W. Roberts in Scientific Reports. 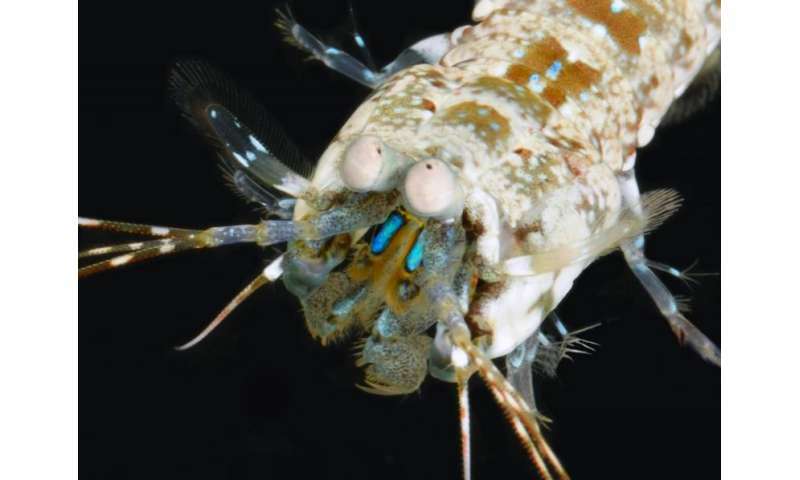 Mantis shrimp have the world's best eyes—but why?